Continuing our coverage of AMD’s APU13 conference, one of this morning’s keynotes has been from Sony’s VP of Research & Development in North America, Dominic Mallinson. Most of Dominic’s presentation was a recap of the PS4 thus far – including some detail in why Sony went with an AMD APU for the console – but Dominic did throw in one more piece of information on the PS4’s specifications that we haven’t heard before. Specifically, the PS4’s audio DSP is based on AMD’s TrueAudio technology. Briefly, from a console-centric view this isn’t of great surprise. We’ve had every reason to believe that the PS4’s audio DSP would have similar capabilities to TrueAudio given the features and low die space cost of today’s audio DSPs, coupled with Sony’s previous comments on the matter. So from that perspective this isn’t a significant revelation as far as the PS4’s audio capabilities are concerned, but we do finally have a bit more detail on the underlying hardware powering it. But from a PC perspective however, this is going to be more important and unexpected news. At this time we don’t know what the underlying API is like – AMD hasn’t even released the TrueAudio PC API yet – but the shared hardware is going to be a big deal for both AMD’s CPUs and APUs. One of the challenges we discussed as facing TrueAudio is developer adoption; AMD has to convince developers to take the time to program for TrueAudio along with more traditional CPU sound engines. AMD has been working with audio middleware developers to help bootstrap TrueAudio adoption, but today’s announcement would take that one step further. PS4 utilizing TrueAudio means there will be at least some level of audio engine portability between the PS4 and current generation AMD products. To that end if developers can write high quality audio engines on the PS4 thanks to the presence of the dedicated audio DSP, and then take that audio engine and bring it to the PC to run on GPU/APU TrueAudio DSPs, then that provides a further avenue for bootstrapping TrueAudio usage in games. So much like Mantle in the graphics space, a shared console connection for TrueAudio in the audio space would allow for AMD to leverage their console connection to both allow better/easier porting from consoles, and to achieve the critical mass necessary to make tapping these low-level hardware features viable and worthwhile for a wider pool of developers. That said, AMD isn’t promoting TrueAudio as a console porting solution right now like they have been Mantle, but the potential is there if AMD and developers seek to exploit it. Which if nothing else makes TrueAudio all the more worth keeping an eye on over the next year, as solving the bootstrap/adoption issue will be a critical factor in the technology’s success. On that note, according to AMD’s latest schedule Thief is still expected to be the PC TrueAudio launch title, so we should be getting to see the first fruits of AMD’s labor here in February. TrueAudio will drive the adoption of Kaveri over chips from Intel. 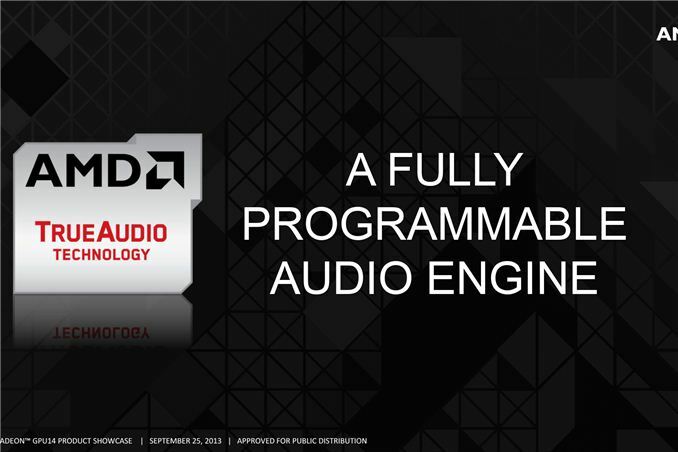 TrueAudio will drive the use of AMD discrete cards over those from Nvidia.